This species is accepted, and its native range is Uganda to S. Tropical Africa. Annual. Culms erect, or geniculately ascending; robust, or of moderate stature, or slender; 30-150 cm long. Lateral branches ample. Leaf-sheaths hispid. Ligule a ciliate membrane. Leaf-blades tapering towards sheath, or parallel-sided; 10-25(-30) cm long; 3-8(-13) mm wide. Leaf-blade surface glabrous, or hispid. Leaf-blade apex acuminate. Inflorescence a panicle. Panicle open; ovate; (6-)10-20(-30) cm long. Panicle branches capillary; straight, or flexuous. Spikelets solitary. Fertile spikelets pedicelled. Spikelets comprising 1 basal sterile florets; 1 fertile florets; without rhachilla extension. Spikelets ovate; dorsally compressed; 2.4-3 mm long; falling entire. Glumes similar; reaching apex of florets; thinner than fertile lemma; gaping. Lower glume ovate; 0.5-0.66 length of spikelet; membranous; without keels; 1(-5) -veined. Lower glume lateral veins absent, or obscure. Lower glume apex acuminate. Upper glume ovate; 1 length of spikelet; membranous; without keels; 5-7 -veined. Upper glume apex acuminate. Basal sterile florets male; with palea. Lemma of lower sterile floret similar to upper glume; ovate; 1 length of spikelet; membranous; 7 -veined; acuminate. Fertile lemma oblong; dorsally compressed; 1.75 mm long; indurate; pallid; shiny; without keel. Lemma margins involute. Lemma apex obtuse. Palea involute; indurate. Tufted annual with culms 25–100 cm. high. Leaf laminae 10–25 cm. long and 3–8 mm. wide, linear, straight at the base or cordate, acute or acuminate. 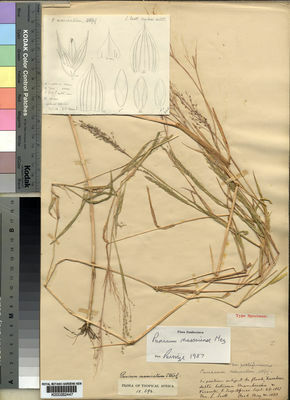 Panicle 7–20 cm. long, ovate or ovate oblong, much branched, the branches fine and often flexuous. Spikelets 2.5–3 mm. long, ovate; inferior glume 1/2–2/3 the length of the spikelet, broadly ovate, 1(5)-nerved, acuminate; superior glume ovate, 5–7-nerved, recurved acuminate; inferior lemma 5–7-nerved, its palea well developed, male; superior lemma pale and glossy. Slender to robust annual; culms 30–150 cm. high, erect or geniculately ascending, usually much branched. Leaf-sheaths usually conspicuously hispid, occasionally glabrous; blades linear, 10–25(–30) cm. long, 3–8(–13) mm. wide, straight or narrowed at the base, flat, glabrous to hispid, acuminate. Panicle ovate to ovate-oblong, (6–)10–20(–30) cm. long, much branched, the branches fine and often flexuous. Spikelets ovate, 2.4–3 mm. 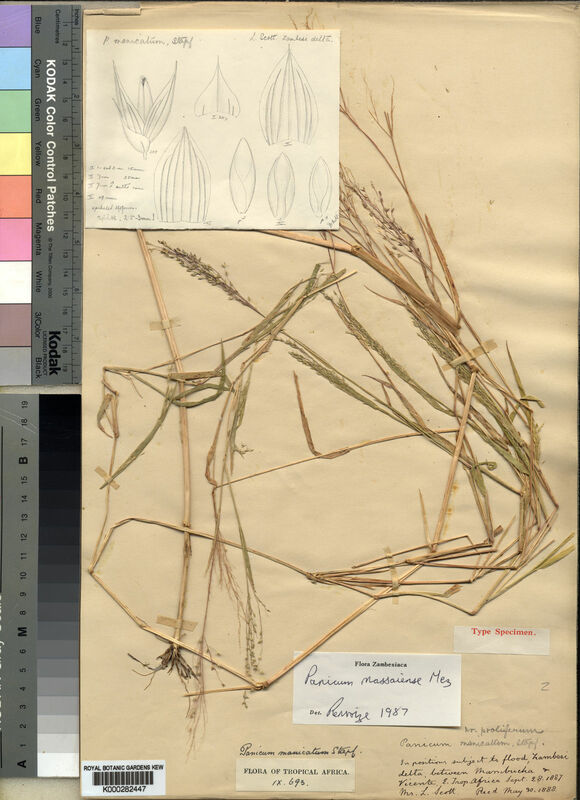 long, often purplish; lower glume broadly ovate, 1/2–2/3 the length of the spikelet, 1(–5)-nerved, acuminate; upper glume ovate, 5–7-nerved, acuminate; lower lemma 7-nerved, male, its palea well developed; upper lemma pale and glossy. Seasonally damp places in wooded grassland or deciduous bushland; 300–1700 m.
Jackson & Wiehe, Ann. list Nyasaland grasses: 51 (1958). Stapf in Flora of Tropical Africa 9: 680 (1920). Mez in A. Engler, Botanische Jahrbücher für Systematik, Pflanzengeschichte und Pflanzengeographie: 34: 144 (1904).